Welcome to Iliochori the town of the sun situated in the 'Epirus's hard in the nord of Greece. A place that anybody can not miss the opportunity to visit for any reason! This is the Website of ILIOCHORI (The Town of the Sun). 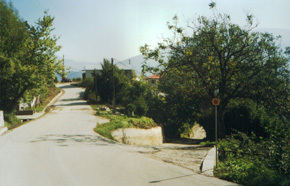 The name "ILIOCHORI" in greek mean"Town of the Sun". ILIOCHORI one light, a lighthouse of freedom. The town of Iliochori (known in the past as Dobrinovo) is one of the beautiful towns of the Zagori (than in Slavic language means " Place behind the Montains") part of the Community of Tymfis. The town is found to approximately 71 km to the Northeast of the city of Ioannina, situated in an evocative forest to 1050 m. of altitude, in the mountains of Tymfis. Surrounded by the green forests of holm oak, and highest pines of the Mediterranean. The surrounding territory is covered by many rivers, with characteristic bridges in stone of arc, that they come down to the valleys. From Iliochori it is enjoyed the beautiful view of Tymfis. Its one of many characteristic towns of this area, whose houses are constructed in stone, with tight and high windows, balconies in wood and the roofs in plaka. Usually the houses are surrounded by a courtyard which it is get through by a large gate, sourmont from a lintel covered wood in plaka too. The place is right to make several activities: excursions on foot, in the forests, in bicycle and and in the waterfalls and in the vallerys of the Kriopotamos river. In this places, the orthodox religion is a lot felt, testified from the presence of various churches, constructed in the places where the hermits sheltered themselves in order to pray. Some km before Iliochori its found the village of the Vlachs that every year attracts many tourists, from every part of Greece and all the world. Iliochori is found near the National Park of Pindos where it is found still today the brown bear, species protect by the WWF. Iliochori - Dobrinovo: At the borders of the world where time seems to have stopped, full of music, dance, rhythm, history, adventure, magic. An encounter with one of the last still existing paradises.